Our Solid PCBN / CBN inserts display a serious of preminum performance, such as strong corrosion resistant, perform a good thermal stability and red-hardness, suitable to process cast iron, quenched steel and other kinds of ferrous metal.CBN polycrystalline block cutter of our company shall greatly improve cutting speed and realize real high-speed cutting; meanwhile it is fit for continuous processing; dry cutting causes no pollution and no noise. 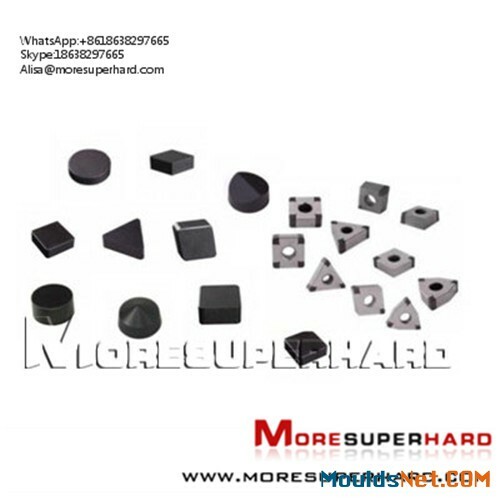 Currently our company can provide round,cube, square and triangle solid PCBN inserts (Polycrystalline Cubic Boron Nitride). 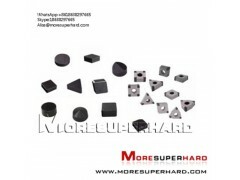 More Superhard PCBN cutter insert ( Polycrystalline Cubic Boron Nitride) mainly used for ferrous materials machining,like gray cast, cast iron,carbon steels, alloy steels, nickel or cobalt, etc... PCBN Diamond (polycrystalline cubic boron nitride) products is second only to diamond in hardness. The hardness allows the ability to machine hardened work pieces. The high thermal conductivity of PCBN allow for an increase in tool life over Carbide Tools. Furthermore, the high chemical stability allows for PCBN to be stable up to 1000° C and no reaction with Fe, Ni, CO etc... Allowing easy grinding and EDM Cutting. PCBN is made by high pressure high temperature sintering of cubic boron nitride with a binder pahase, and there are mainly tow groups of binders, namely metal binder and ceramic binder. CBN and diamond are very similar in crystal structure, chemical bond and lattice parameters, thus they perfotm quite similar hardness and strength,. In cutting applications, the wear resistance of PCBN exceeds 50 times that of tungsten carbide. PCBN is typically recommended to machine ferrous materials such as hardened steel components over the range 45 to 70HRc and grey cast irons. The material combines high hot hardness, chemical stability and abrasion resistance to provide an effective solution for machining these very different work-piece materials. PCBN inserts are compound super-hard material of polycrystalline cubic boron nitride layer and WC (Tungsten carbide) sintered under ultrahigh pressure and high temperature.The PCBN insert has the hardness, wear resistance and thermal stability of cubic boron nitride (CBN) and the shock-resistant toughness of hard alloy. It is the ideal material of cutting processing of high-hard ferrous metals and non-ferrous metal alloy. Other types of inserts like RCGN CBN inserts,RCGN inserts ,SNGA ,SCMW,TNGA,CNGA,VNGA,VCGW,CCMW,TCMW CBN inserts all available upon request,our products test well in European countries,Japan, and USA markets.